3.1 How safe is handloading or reloading? 3.2 How good is reloaded ammunition? 3.4 My caliber lists a small base die set. Can I also use a full length or neck die set? 3.5 What is the difference between a roll crimp and a taper crimp? 3.6 What is a small base die? Reloading, generally known as handloading, is the process of loading shotgun shells or firearm cartridges. This involves the assembly of individual components such as hull, primer, bullet, and powder, as opposed to buying a factory loaded ammunition. Further, reloading uses shells from previously fired ammunition. This requires cleaning and other forms of preparation to make them suitable for loading. This is where reloading dies come in. They come in different sizes and shapes as they have different functions. The decapping dies have a long thin pin in the middle to push the expended primer out of the case. On the other hand, resizing dies operate outside of the case to return it to the correct diameter. Generally, the die is adjusted to go down to within 50 thousandths of an inch of the case rim. That’s the very reason that makes it imperative to find out the best reloading dies for 300 blackout. Standard dies are made using hardened steel. They require the case to be lubricated for resizing purposes, as the latter needs a large amount of force. Due to a large amount of force required by rifle cartridges, their cases need to be lubricated. When using smaller and thinner handgun cartridges, the cases can either be lubricated or not. This then requires one to pick the best dies for particular ammunition, and here are 4 of our best picks for 300 blackout. The Lee Precision 300 AAC Blackout is a 3-die set and comes with very limited production. It is a high-quality die set at a very affordable price. The set includes a factory crimp die, a full-length sizing die, a universal shell holder, easily adjustable dead length bullet seating die, a powder dipper and an instruction manual. The crimp die gives a segmented straight crimp, which gives the ammunition more accuracy and high threshold to withstand rough handling. It is especially ideal for combat and hunting, making this set quite versatile and cost saving in the long run. The full-length sizing die ensures that, if done properly, it delivers the best accuracy, reliable chambering, as well as improved case life. Having the right shell holder for reloading is tantamount to having the right shoes for a particular occasion. You should choose the right shell holder for the right caliber. You do not want to blow yourself up from having a wrong shell holder. The dead length bullet seating die is very handy. If the case neck was sized too small, the bullet resizes the case neck when seated. Therefore, when the bullet is not sitting at the right depth or is not properly placed, the die should be turned in so as to touch the shell holder. This eliminates clearance in the press for a better and uniform bullet seating depth. A uniform bullet seating depth then increases accuracy and hence better ammunition performance. You will definitely be the envy of your buddies on that hunting trip when you snag that deer on the first attempt. Especially if you are a newbie. – Higher rough handling threshold. – Best for combat and hunting. – The universal shell holder in this kit is limiting as it would not be usable with some calibers. – This product is manufactured using chemicals that cause birth defects and cancer, as according to the State of California. RCBS manufacturer has 60 years of experience in making precision dies. As such, many gravitate towards their products as it is a trusted brand which never fails to produce quality products. The company craftsmen produce reloading dies for many calibers, as compared to other die manufacturers in the industry. The RCBS .300 AAC Blackout 22407’s inside is precision-drilled and reamed to standards as high as those of the finest gun mechanisms. This crimping die set is made of the highest quality and has some amazing features. It is best for reloading hunting gear and comes with a new taper crimp seating die as well as a small base sizing die. The RCBS Taper die set is preferred by progressive re-loaders as it makes reloading of AR-style or semi-auto shooters easier. Veteran reloaders are definitely the best people to seek advice from about the best dies. 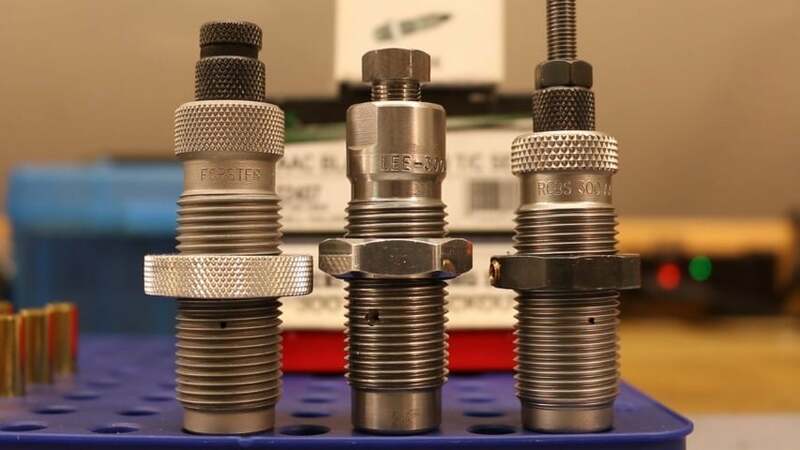 Considering that many if not all turn to the RCBS Taper Crimp Die Set, new reloaders would definitely be at a great disadvantage if they are not using this set. Regular users of this set attest to the high quality assured by the manufacturer from their favorable experiences with the same. The full length dies for bottleneck cases have vents that prevent damage to cases caused by trapped air. Every person knows how trapped air is destructive, take for example when you have it in your stomach. Now, just imagine having trapped air when reloading. Disaster. Headspace is kept at a minimum to avoid changing the body length of cases during full-length sizing. Each die is hardened properly and hand polished. The special finishing ensures that the die withstands many years of wear caused by case sizing. For particular calibers, this product’s seater die has an in-built taper crimp appropriate for them. For consumers looking for an affordable product of high quality, this is the best product out there. – Full length dies have vents to let air out. – There are better quality dies in the market though. However, for a casual user, this product is the best bet as they get to enjoy high quality at a low price. – Other consumers use it exclusively due to its good performance, making it an ideal product for anyone. Hornady reloading dies are the finest dies in machine craftsmanship. The Hornady die set in particular offers users more precise reloading. This feature is enabled through easier adjustments and better alignment to have smoother functioning. The Hornady die set is by far a superior product as the manufacturer has been in the industry and specifically produces these high-end dies for all types of ammunition. As such, this die set has one of the finest internal finishes in the industry and provides a shooter with a lifetime of reloading. These high-quality dies are very well crafted and guarantee never to wear out or break from normal use. Not only does this save on costs and regular purchases, but also reduces the stress of having to think of the inevitable buy that you are going to need to do after every few months of use. The Hornady 300 AAC whisper is a full-length die, and one is supposed to use shell holder number 16 with it. At only 1.3 pounds, this product is by no means a small base sizing die. It comes with a long stem decapping die. Once the die is adjusted, the excess stem can be cut off using a hacksaw and filed as it is not necessary to maintain the extra length. However, if left as it is, the long stem can scratch the skin or snack on clothing if the shooter suddenly reaches over the top of the press, and nobody would be too happy with such an experience. Imagine this happening to your arm, and you have to flinch because you are in so much pain and your shot goes wild. In the first place, you may hurt someone depending on whether you are at the range or out in the field. In the second place, it is just plain embarrassing in front of friends because you will look like the newbie you are or the show off who actually knows nothing of the game. Some consumers have previously used the Hornady die set to convert 223/5.56 brass into 300AAC and it worked with their rifles. All in all, this product has a nice finish and has a locking ring which is very much appreciated by users. For its price, the Hornady die set is a great steal. – Finest internal finishing giving a lifetime of reloading. – Some people have complained that the zip spindle feature does not give when the neck is too tight, despite it being easy to adjust. – The long threaded stem of the zip spindle has sharp edges at the end, which can scratch and exposed arm if reaching over the top of the press. More than any other tool, the Lee Precision Factory Crimp Die crimps the bullet in place more firmly. It is an ideal product for the 300 AAC Blackout as it has been tested on bullets that have no crimp groove and still managed to shoot more accurately. Accuracy is brought about by a firm crimp as pressure has to build to high levels before the bullet begins to move. Hence, the higher start pressure results in uniform pressure distribution and less volatility variation. Think of it like a pressure cooker. You need a good base to get the desired results. Additionally, you need a tight lid to contain the pressure so that food is cooked evenly. Therefore, when the pressure builds evenly around the bullet, it moves smoothly and thus the accuracy level is higher. This die is not recommended for cast bullets. It has a cullet inside to squeeze the bullet together when running it into the die. Thus, since a cast bullet has a light case, it would be damaged in the process. Additionally, the Lee Precision Factory Crimp Die is a roll crimp die and therefore does not use a taper crimp as many would think. It works on all presses including the Hornady progressive presses, which use standard thread dies. Customers who have used the product attest that it produces good crimps on reformed brass without damaged case necks. Since brass does not have to be trimmed to exact length, this product works with non-cannulated bullets without significant accuracy difference. – Produces good crimps on reformed brass. – Works well with non-cannulated bullets. – Cannot be used for cast bullets. Any round of ammunition that comes out of crimping with any deformation to the case means that something was wrong with the depth setting of one of the dies. Single stage presses require that each round is individually processed. Therefore, it is easier to point out the stage where the problem occurred. However, for progressive presses, the problem is not as obvious. One can only find out at what stage the problem started by removing the round after each stage until distortion is seen. Most often, the problem is usually with the die setting of the last processed stage. Over time, the pins of decapping dies become bent or become loose in its holder due to constant use. The pressure from a decapping pin is quite significant, as illustrated by damaged brass cases. When the decapping pin hits the case base instead of aligning with the primer hole, there are high chances that the case gets damaged. This makes the use of the case impossible. Therefore, one needs to ensure that the decapping pin is closely monitored for such cases of bending. The pin should always be straight and held tightly in place. Before each loading session, routinely check the pin to avoid such problems. Having the decapping pin protruding below the base of the die is engineered to make checking for straightness easy. Additionally, a push of the finger lets you know whether it has become loose or not. Among the many different queries floating on the internet, here is what we have considered as the most common ones to answer for you. How safe is handloading or reloading? It is very safe to do reloading. Since today’s gun powders are smokeless as opposed to black powders of old, they are classified as propellants and not explosives. As such, when properly used, they only burn when ignited. As long as proper care and use are observed, reloading is quite safe. How good is reloaded ammunition? Reloaded ammunition is usually better than factory loaded. If carefully done, it can be fine-tuned to accommodate any gun and certain types of shooting. This results in greater accuracy and versatility as it caters to a wide array of guns. My caliber lists a small base die set. Can I also use a full length or neck die set? The small base die sets are meant for ammunition used in a lever action, auto, and semi-auto rifles. This is to enable the loaded chambers to extract easily. In some calibers, the small base die sets the shoulder of the case back a thousandth smaller more than a full-length die. Therefore, the full-length die is not recommended for ammo used in auto, semis or lever action. In this case, since the caliber says to use a small base die set, do so to preserve its functionality. What is the difference between a roll crimp and a taper crimp? The seater die rolls a very small part of the case mouth into the bullet canular with a roll crimp. When the bullet has no canular or the seater die is set too low, the seater roll die will try to form the crimp. On the other hand, with the taper crimp die, it squeezes the case around the bullet. It makes no indentation and thus no visible crimp. What is a small base die? This is another type of full-length sizing die, typically used for reloading semi-automatic rifles. The only difference between a small base die and a full-length die is that the former compresses the brass a little bit more. This extra compression helps to make sure that the case properly extracts from a semi-auto firearm. Choosing the best reloading dies for 300 blackout is not easy as a number of factors have to be considered. Users of firearms need to know their rifle canister dimensions and also the level of accuracy they need. When choosing a reloading die, it is important to remember that not all dies work for just any type of gun. User manuals should also be read through after buying die sets as they give a step by step breakdown of product use. If properly used, some die sets last for very long, sometimes even the lifetime of the gun used. Thus, users need to choose dies, not based on the price tag, but on their canister needs and quality of dies.